Just minutes from top shopping and festive attractions, the hotel is the perfect base for a seasonal shopping spree! London is a magical city at any time of year but perhaps even more so in the run up to Christmas when the streets are draped in twinkling lights and shop windows are filled with magnificent festive displays. Hilton London Metropole’s central location close to some of the capital’s top shopping streets and festive attractions – including Hyde Park’s Winter Wonderland – makes it easy to combine that all-important Christmas shopping with a spot of seasonal merriment. And with rooms starting at just £149 per night, including breakfast, the hotel is the perfect place to relax at the end of a busy day. Located only ten minutes from the capital’s famous shopping destinations – Oxford Street, Regent Street and Bond Street – Hilton London Metropole guests won’t have to travel far to find that perfect gift for someone special. From the world-renowned Hamleys toy store, to British classics such as Liberty and Fortnum & Mason and the world-famous Selfridges department store, the choice is endless. Meanwhile, for a real festive extravaganza, Hyde Park Winter Wonderland – just ten minutes from Hilton London Metropole – is the place to head. The park is completely transformed to live up to its name, with over 100 rides and attractions including ice skating to live music from the bandstand, roller coaster rides, The Magical Ice Kingdom which transports visitors to the depths of the ocean to discover beautiful ice sculptures, the cool Bar Ice, where even the tables and chairs are made of ice and a range of Christmas market stalls and bars. It’s the perfect place to get into the Christmas spirit. Those wanting to add a spot of theatricality to their city break will find London has an abundance of festive performances, from the elegance of The Nutcracker at The Royal Albert Hall and traditional A Christmas Carol at the Old Vic to the heart-warming Nativity! The Musical, there’s something to get everyone in the Christmas mood. To set guests up for a busy day, Hilton London Metropole offers Hilton’s famous breakfast buffet, featuring more than 100 hot and cold items, while the innovative Herb N’ Kitchen “grab-and-go” café-style restaurant ensures guests can stock up on food and drink for the day ahead. And after a long day of shopping and festivities, Hilton London Metropole offers a welcome retreat. 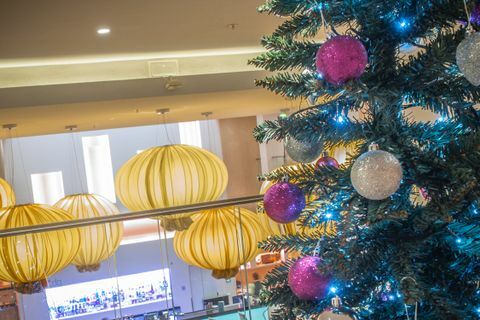 Guests can put their feet up with a festive cocktail in the contemporary EDG Bar & Lounge, relax in the LivingWell Health Club with its 12.5m heated pool and enjoy a delicious Italian-inspired meal in the Fiamma Restaurant. With stylish rooms starting at just £149 per night, Hilton London Metropole offers all the elements needed for a perfect pre-Christmas break, in a location that’s hard to beat!